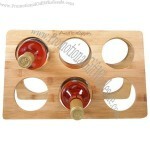 Durable and stylish wine rack is made from sustainably farmed bamboo. Collapsible design folds flat for easy storage. Conveniently holds six wine bottles.